This article is about the castle on Vvardenfell. For the city on the mainland, see Ebonheart. 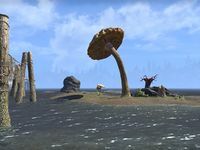 After visiting the mainland Ebonheart in 2E 583, Vivec was so enthralled by the city that he decreed that either the city be moved to Vvardenfell, or a new Ebonheart be built on the island in emulation of the original. The Tribunal canons and House Hlaalu engineers, who were already overseeing the ongoing construction of Vivec City, were immediately directed to draw up plans to fulfill Vivec's wishes. Centuries passed before those plans bore fruit, however. 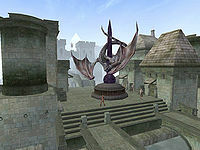 It was only after Vvardenfell was opened for settlement in 3E 414 that Castle Ebonheart was finally built to serve as the new Imperial capital of the island. Due to the proximity of the fortress to Vivec City, it can be assumed that it was obliterated by the fall of Baar Dau in 4E 5, the Red Year.